The Thermo (Foxboro) TVA1000 is a portable organic vapor monitor. The analyzer uses both a flame ionization detector (FID) and a photo ionization detector (PID) to sample and measure gases. If you need a fast, accurate and easy-to-use analyzer for portable, efficient, productive monitoring in industrial hygiene or hazardous waste applications, look no further. 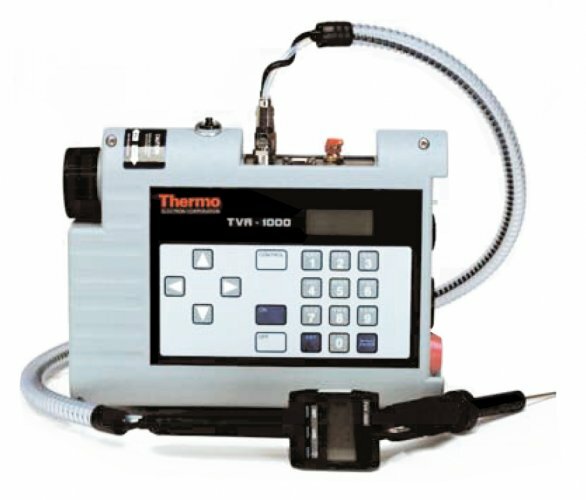 The Foxboro TVA 1000 is the first over-the-shoulder portable vapor analyzer to offer both photoionization and flame-ionization detection in a single instrument. It can be a cost-effective tool in helping you meet today’s requirements for a healthier and safer workplace, as well as a cleaner environment. With its unique single or dual detector design and on-board datalogging capability, your overall monitoring time is reduced because of the number of vapors detected. In addition, on-board datalogging improves the integrity of the data by eliminating transcription errors. With a dynamic range of 0 to 2,000 ppm on the PID detector and 0 to 50,000 ppm on the FID, the TVA is the unit of choice for environmental professionals responsible for site investigations and emergency response requiring both PID and FID capabilities.